While the mainstream media has invoked as its new policy the spreading of disinformation (aka: fake news) about President Trump and his administration, this blog is keeping a running tally on the administration's accomplishments. 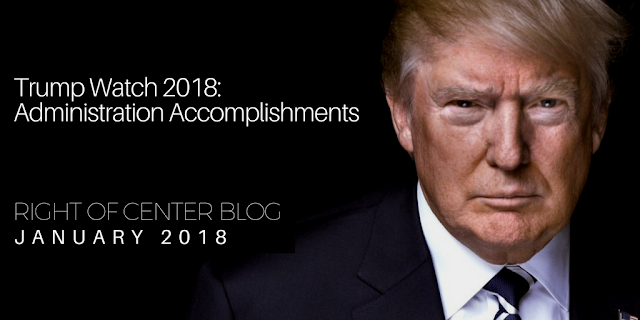 Make sure to follow Trump Watch 2018 here at www.rightofcenterblog.com for the latest positive news from the Trump administration. North Korea announced it will meet directly with President Trump to discuss the de-nuclearization of the Korean Peninsula. Such high level talks between the two nations are unprecedented. President Trump announced a formal meeting with North Korean leader Kim Jong Un, scheduled for June 12. President Trump named the "most pro-black President of our lifetime"